WashingtonExec recently spoke with Anna Lulushi, a local high school senior who has conducted neuroscience research. Lulushi, who is enrolled at Thomas Jefferson High School for Science and Technology, is one of several individuals scheduled to speak at the annual K-12 STEM Symposium on April 14. The event is free and open to the public, but attendees are asked to register in advance. WashingtonExec: How did you become interested in neuroscience and computer science? Lulushi: Our quest for understanding the great mysteries of the brain has always fascinated me, and I am excited to study neuroscience and make my own mark on this quest. Neuroscience is the most interdisciplinary field there is, incorporating areas such as biology, math and computer science. Before I learned calculus, I had looked at neuroscience from a purely biological standpoint. But with calculus, different areas of biology became intertwined together. Calculus could model these areas, and I realized that integrating math and biology provides a greater level of insight into neuroscience. My interest in computer science started in middle school, when my older brother was starting his career at TJHSST. I was exposed to a new level of reasoning and problem solving that was challenging and exciting to me. When I got to TJHSST I made sure to enroll in as many computer science courses as I could. I also took the time to investigate computer science on my own, teaching myself languages such as Python. The algorithms and logic that are inherent to computer science attracted me to further investigate its applications to neuroscience research. 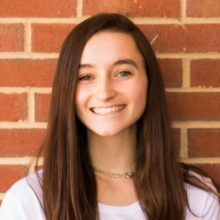 As I learned during my research internship at George Mason University, the power of computers and data science enables us to develop deep insights into the workings of the brain. Imaging and modeling software brings these insights to life. Viewing neuroscience from a qualitative and quantitative perspective demonstrates its versatility. WashingtonExec:​ What are the implications of your research on the motor and visual cortices of the brain during learning​? Lulushi: In the fall semester, as part of my senior research lab in neuroscience at TJHSST, I conducted an experiment on neuroplasticity and learning. Because of the resources available at my school, my partner and I were able to develop and implement a new paradigm for modeling learning, the reversed maze paradigm. We 3D-printed a maze, projected a live-streamed video of the maze onto a computer monitor, and then reversed the image so that when a subject was tracing through the maze and moved their hand to the left, it would appear to move to the right on the monitor. As subjects traversed through the maze, we recorded their brainwaves using an EEG and later analyzed them in MatLab. The analysis revealed findings that corresponded with previous papers published, which is that implicit learning tasks (such as going through the maze) that involve both the visual and motor cortices result in decreased theta waves. The results used from this study could potentially be used in the future for rehabilitation using motor imagery techniques. WashingtonExec: What have you learned on inspiring kids about STEM in your time tutoring and volunteering at the National Air and Space Museum? Lulushi: The most important thing that I’ve learned from my time volunteering is that everyone, in some way, has a connection to STEM in their life, and the key to getting kids excited about STEM is to find that link. Lulushi: One issue that I see in our society today, not just within STEM but in all academic subjects, is the fear of failure that is present amongst so many young people. At first glance, it makes sense to be afraid of failure — it is scary. But, when we look deeper, it’s clear that no one has made any significant progress on their first try. Especially within STEM, it often takes countless trials, revisions and tweaking in order to perfect an invention or get meaningful results from an experiment. Being enrolled in STEM classes consists of much more than just learning a set of formulas or terms. It’s about learning how to think critically, how to apply what you already know to new and challenging situations, and, what I think is the most important part, how to deal with failure. These classes are not supposed to be easy. They are supposed to challenge us, and to teach us how to deal with failure in a low-risk environment. Without ever being challenged, there is no feasible chance of meaningful, productive growth. But STEM teaches kids to love that challenge, to anticipate it and prepare for how best to deal with it when it comes. WashingtonExec: Do you see yourself pursuing a career in neuroscience research? Lulushi: Yes, definitely. I intend to major in neuroscience in college, and will continue to pursue my interest either in graduate or medical school afterwards.